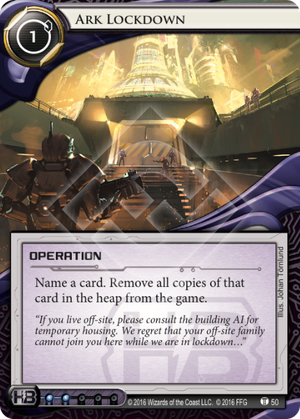 Can the Corp name a card that is not in the heap when playing Ark Lockdown? Yes. Abilities are only checked for their potential to change the game state to determine whether those abilities can be triggered. Once an ability begins resolving, it does not have to change the game state. This is a super-focused, almost unpreventable operation that completely destroys any copies in the heap as opposed to simply slowing down their recursion. It's got several advantages compared to similar cards like Blacklist and Chronos Project: It's a 1 operation out of HB, who specialize in glacier decks that have one more option to outlast something like MaxX: Maximum Punk Rock by wiping out a Levy AR Lab Access. Play enough and you can snipe Déjà Vus or just go straight for the breakers like Paperclip. If they expect its ability to save them against something like Vanilla, they will be in for a rude awakening. With Consulting Visit or another tutor, as soon as that winning card hits the heap, play this and your path to victory is that much easier. Put this in Chronos Protocol: Selective Mind-mapping for pinpoint sniping to destroy the runner's win condition. This ought to be strong against the aforementioned MaxX: Maximum Punk Rock, but also Shapers still relying on Clone Chip and Armand "Geist" Walker: Tech Lord. Oh, and just like Chronos Project, DO NOT HAVE BLACKLIST REZZED WHEN USING THIS. Enjoy! A strong card in a meta where runners pack single copies of breakers and rely on pulling things out of their heap at key moments. The most challenging thing about using this card is deciding when to pull the trigger and what to target. It is often better to use it early to hamper a runner than to clog your hand holding it and waiting for the stars to align for the perfect play that wins the game. At least half the decks these days run Paperclip. Paperclip is ••• so it's fairly expensive to run three of it. So most non-anarch decks will run 2 or even only 1. Imagine your opponent is playing non-anarch and you see a Paperclip going into the heap. The odds are very high that there is at most one more Paperclip left in the deck. If you snipe that one Paperclip in the heap the chance of the runner finding another one are low. That means that an Ark Lockdown even on a single Paperclip has the potential to make any barrier lock out the player for a serious number of turns or at least force them to use an inefficient AI. This opportunity arises because people will generally put Paperclip straight in the heap (except against Skorpios) as you can install it from the heap during a run but from hand only before a run. If the runner likes to recur cards, e.g. with Clone Chip, Ark Lockdown can throw a wrench in there as well. Because of the potential for Ark Lockdown to seriously hurt the runner I'd recommend including at least one copy of it in every HB deck and to seriously consider it in other decks except Skorpios (which doesn't need it).